It’s axiomatic that Dubai World Cup night, with its formidable 2019 purses of $35 million across the nine-race card, has attracted a slew of the world’s best older horses, whose connections are gunning for the big late-season money on the Gulf. Horse races with titanic pots of lucre waiting at the finish line have a way of attracting that. This year, almost as a side effect, the Maktoum family’s rocketing of the World Cup purses into the stratosphere of the mid-eight figures deftly tosses yet another top-this gauntlet across the Atlantic to Frank Stronach and the Stronach Group, whose Pegasus World Cup card has suddenly been reduced by the Maktoums to the world’s second-richest race day. We’ll see what Mr. Stronach has to say about that when the 2020 Pegasus purses are announced, but such contests as these can only be engaged in by very few people. In fact, it wouldn’t be wise to bet against the Maktoums, or against the Stronachs, who are hosting a key Derby prep this weekend — the Florida Derby . But Sheikh Mohammed bin Rashid Al Maktoum’s win of last November’s Melbourne Cup after 30 years — repeat, three decades — of assiduous racing, provides a fine snapshot of the Dubai ruler’s resolute tenacity in the sport, and serves as a splendid statement for the role of the Sheikh and his Godolphin stable globally, as well as explaining his dominance at the Meydan. Sheikh Mohammed sits with the formidable horsewoman and passionate owner Queen Elizabeth II in the Royal Box at the Ascot meeting. He’s a horseman through and through. In addition to the Maktoums’ long ownership of Godolphin stables in the UK, it is not by accident that family members also own what amounts to an estimated 30,000 acres of prime Kentucky horse farms, nor is it surprising that they are regular attendees at the Keeneland Sales. From the storied office building of Keeneland, sales and track officials can see the Lexington airport tarmac and are, during sales season each spring and fall, on the lookout for the Maktoum family Boeing 747 to roll in. Whether the Dubai World Cup is the richest or second-richest horse race in the world, it always draws an interesting and slightly patchwork field, which is part of its late-season charm and, at the same time, a big part of the difficulty the race presents to handicappers. 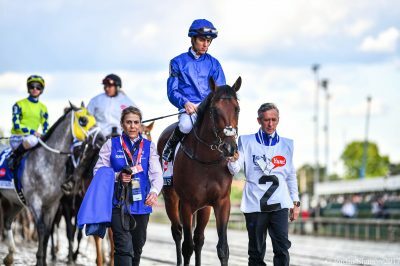 Breaking from the 12 post position in the thirteen-horse field, Thunder Snow is an Irish-bred owned by the Maktoums’ Godolphin Stables and trained by one of the Meydan’s winningest trainers, Saeed bin Suroor. Many American fans will remember Snow’s antics at the start of the 2017 Kentucky Derby , when he famously freaked out, bucked, and had to be pulled up. Lesser owners would have thrown in the towel or, at least, heavily recalibrated their strategy for the horse. The Maktoums kept plugging away, and, although the son of Helmet has clearly not become a Justify, he has settled and his earnings took a big spike north last year, as he won what the Maktoums are clearly hoping was only his first Dubai World Cup. Thunder Snow is gunning to become the first horse in the history of the race to win it more than once. 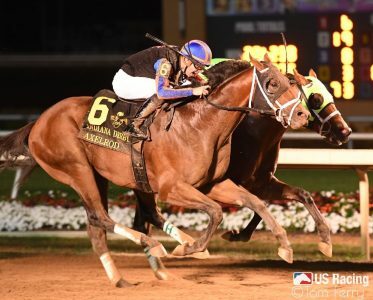 Thunder Snow had enough in him to show behind Accelerate and Gunnevera, respectively, in last year’s Breeder’s Cup Classic , and he bested the favored West Coast in the 2018 Dubai World Cup. At this year’s Meydan meeting, Snow finished a distant second behind fellow World Cup contender Capezzano in Round 3 of the Maktoum Challenge prep. His backers are undoubtedly hoping that he didn’t show his best that day and that this means good things on Saturday. A year ago in Round 3, Thunder Snow was beaten by a middling North America, the horse owned by super-quirky Chechen strongman and staunch Vladimir Putin ally Ramzan Kadyrov, who prefers to base and race his stable in the Emirates, far from his unstable homeland. Like Thunder Snow, North America ran in last year’s World Cup, but he has improved considerably since then and has clawed his way to favorite status for this race. Last year, he did not run well and uncertainties abound as to whether his recent surge can be trusted in a field with a host of proven Group/Grade I performers. But he looks strong, his workouts have been fine and Meydan is, more or less, his home. He has the home court advantage, if you will, and he looks fresh. Seeking the Soul carries some surprising, and occasionally overlooked, moxie. 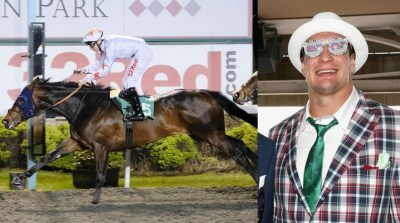 A game second behind City of Light in 2018’s Breeders’ Cup Dirt Mile, and a game second behind City of Light in this year’s Pegasus, one has the sense that Seeking the Soul, trained by the irrepressible Dallas Stewart, can bring his run when he wants to. The question will be whether he wants to on Saturday. The equine Gronkowski and his namesake, the recently retired NFL star Rob Gronkowski (photo via Twitter). Like his two-legged namesake, Gronkowski‘s tough, measured resilience is at his core. His runner-up finish to the great Justify in last year’s Belmont was, however, arguably his best race — and it may have been his last truly great race, as he’s subsequently finished eighth, sixth, third and fifth. His last good race was in August, when he ran second in the Pacific Classic, but Pavel has run only three times since then — and has failed to hit the board in any of those starts, running tenth and fifteenth in the Breeders’ Cup Classic and the Champions Cup, respectively, and fourth in the San Pasqual Stakes. He does not seem to be a factor in this World Cup field. If there is a veteran journeyman in the field, it’s Gunnevera, who ran an admirable second in last year’s Breeders’ Cup Classic, but who followed that with a disappointing sixth in this year’s Pegasus. He ran second to World Cup contender Yoshida in last year’s Woodward. That noted, there aren‘t many racehorses in this field — or any field — that have run twenty races. He knows the ropes, and has proven his mettle by clocking six wins over the years. Fans want to root for Gunnevera — and many do. He tries and tries hard, but it’s by no means a lock that his seventh career win, by far his biggest financially, will come in tomorrow’s feature. Yoshida is more interesting, if unpredictable, than Gunnevera, having migrated to the dirt relatively late in his career and having met with some success, notably winning the 2018 Woodward at Saratoga. Most recently, however, he ran a lackluster sixth in the Pegasus. That does not necessarily mean that he is tiring of dirt tracks, and he does seem to be adapting well to the Meydan, but the question that Meydan and the World Cup always poses to horses that have traveled great distances to compete is how they are doing in the environment. State of the art as it is, Meydan is quite different from American or British tracks. This is why every trainer anywhere, but especially those who travel from the U.S. to the Emirates, pay such microscopic attention to the amount of feed left in the buckets, the sheen of the coats, muscle definition and the general brightness exhibited in a morning breeze. For the astute player, realizing that there are imponderables attached to each horse, working through this field is a matter of weighing known talents and appetites against the questions each horse brings. Closers may have difficulty. The outside post positions, such as that for Thunder Snow, will be less desired, which is why the Korean horse, Dolkong, breaking from the thirteenth position, is admired for nearly catching Thunder Snow in their last meeting, but is not thought to play much of a role in this running of the race. The Japanese horse, KT Brave, breaking from post 11, has just not been in good form lately, which is why he is relatively high in the odds department, alongside New Trails, who logged an unimpressive fourth in Round 3 at Metdan. For New Trails, it may just be about not adapting well to his surroundings. Axelrod gets up in time to win the Indiana Derby (photo by Tom Ferry). Axelrod is not proving himself to be a distance horse. Hence, the approximate 1 ¼-mile distance of the Dubai World Cup is thought to be simply more than he can take. Every horse race brings its own landscape of difficulty to the athletes — Churchill Downs brings intensity, flare and enormous pressure to bear on Derby Day, for instance. Similarly, Dubai brings the intense effort of getting to the World Cup and, for the horses who show up for the prep races, a grueling few weeks of having to maintain their focus in a foreign place. Which means that there is a sort of Zen-like balance that the player must look for: the athletes certainly have to be fit, the pedigree, past performances and workouts all have to make sense. But at Meydan, as at no other track, their characters have to be both strong and flexible enough to live with enormous change.